Consider these moves the foundation for a fitter, more functional you. If you pay attention to your health at all, there’s a good chance you’ve heard this advice before. It makes sense in many instances—mainly your diet—but the truth is that some healthy habits are much more effective when you do them every single day. One such example: moving your body. While any movement is always better than none, there are certain foundational exercises that need to be performed on more than designated workout days, says Ann Phelps, D.P.T., a physical therapist at Athletico Physical Therapy in Chicago. Why? Because that’s how you’ll get the results you want, from improving strength and mobility to building better balance to staying independent longer. You can also easily do these exercises at home. “Perform a few reps when you get out of bed in the morning, during a commercial break, or when you get up to move to another room in the house,” she says. And when any exercise starts to feel too easy, make it a little more challenging with the recommended progression. As always, safety is key. If you have balance problems or injuries, talk to your doctor first about safe exercise. 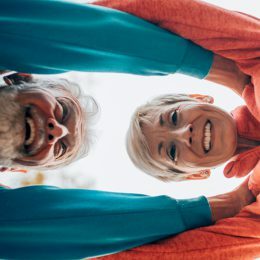 “Standing up from a chair or other surface without using your hands is a good exercise for older adults to perform to maintain good health, fitness, and mobility,” Phelps says. After all, being able to sit down and stand up from a couch, chair, or toilet is often the determining factor in whether someone can live independently or needs full-time care. How to do it: Stand in front of a sturdy chair with your feet between hip- and shoulder-width apart. Your heels should be about six inches in front of the chair, arms held straight out in front of your shoulders. Brace your core. From here, slowly bend your knees and push your hips back to lower your body onto the chair. Pause, then press through the back two-thirds of your feet to stand up again. That’s one rep. Aim for two or three sets of 10 reps total per day. Try not to swing your torso for momentum or use your hands to push back up. Make it harder: Once you’re able to perform two to three sets of 10 reps with good form, try lowering your body to a shorter chair or piece of furniture. Eventually, work up to removing the chair altogether to perform full bodyweight squats. With each rep, lower your body as far as you can comfortably go while keeping your chest up and heels on the floor. Click here to learn why squats are the single most important exercise we do—and the best way to do them for your body. Commonly used as a test for assessing balance, the tandem stance is also a great exercise to perform every day. 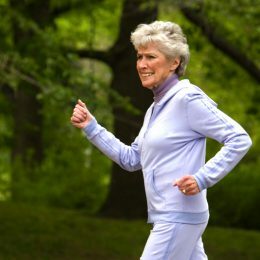 “It can significantly improve balance and stability to increase function and decrease the risk of falls,” Phelps says. How to do it: Stand tall with your feet together, and brace your core. 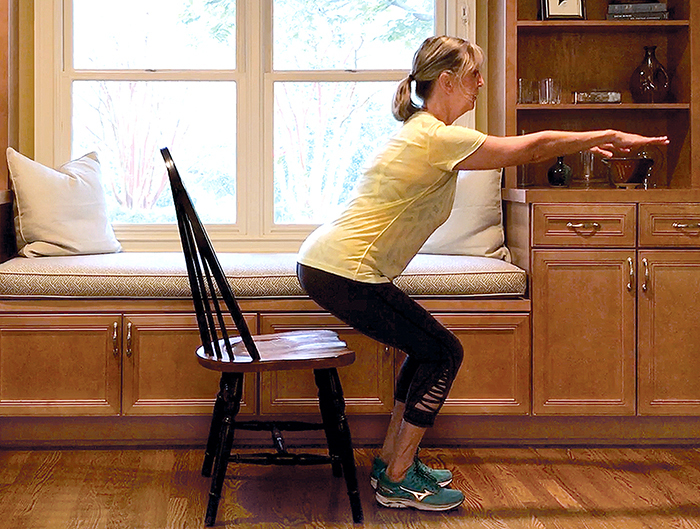 From here—holding onto a wall, counter, or sturdy chair for balance, if necessary—step one foot in front of you so that your front foot’s heel is against your back foot’s toes. Your feet should be in a straight line. Imagine you’re standing on a tightrope or balance beam. Hold this position for 30 seconds or as long as you can, then switch the position of your feet and repeat. Make it harder: First, step into the tandem stance without using a wall for balance. Once you’ve mastered that, perform the exercise while holding a light weight in each hand. Don’t have dumbbells at home? Use water bottles or cans of food. Another option: To really train your balance and strengthen your core, hold a weight in only one hand. Imagine a string through the crown of your head is pulling your spine straight toward the ceiling, and engage your core to avoid leaning to one side. In all its forms, walking is a must-do daily activity, Phelps says. This variation, which requires holding a light weight in each hand, pulls double duty by training your upper body and core strength. It looks much simpler than it feels, and mastering it can improve your ability to perform almost any other exercise and activity that life throws at you. How to do it: Stand tall with your feet hip-width apart and a weight in each hand down by your sides, palms facing your body. Brace your core. From here, slowly walk forward. Imagine a string through the crown of your head is pulling your spine straight toward the ceiling. Walk for 30 seconds or as long as you can, then repeat in the opposite direction. Make it harder: Try introducing more weight. Doing so will not only increase the load placed on your core, back, and glutes, but also on your hands. When using challenging weights, the farmer’s walk becomes a great way to improve grip strength. Plus, check out these other exercises for your grip. This exercise has a tremendous impact on your ability to perform everyday activities that require supporting yourself on one leg at a time, such as walking and climbing stairs, Phelps says. It will also help you discover and resolve any muscular imbalances between your left and right sides. Make it harder: While holding the position, slowly point your lifted foot out in front of you, to the side, and then straight behind you. Repeat for the duration of the exercise. 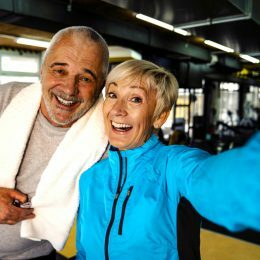 SilverSneakers gives you free, unlimited access to more than 16,000 gyms and fitness centers across the nation, plus classes and tools designed to keep older adults strong and independent. Check your eligibility instantly here. Previous PostShould You Get the New Shingles Vaccine?